Moving from one environment to another can be stressful for anybody; your Savannah kitten is no different. When your kitten first arrives to your home, it is recommended that you have a small room prepared where food, water, and litter box are all readily accessible. Some kittens may run around crazily when they first arrive, while others might need some coaxing. Allow yours to run around and explore the new surroundings a little bit. The best way to win your kitten over is with a new feather toy, which they find difficult to resist. Playing with your kitten will help the two of you quickly form a bond. Some Savannahs also like to crawl into bed and sleep with you. This may also help the two of you form a strong bond quicker. If there are other pets in your home, wait for your kitten to form a strong bond with you and other family members before introducing them to the pets. A 10-day quarantine period is imperative for your kitten's development and health. Since a kitten is typically stressed during their transition period, their immune system is weakened. Mature family pets may carry viral strains that don't affect them, whereas if they were exposed to a kitten, they could have damaging effects. You should use the same litter your kitten has been acclimated to, Feline Pine. This is a pelleted pine litter with a radically different texture and scent than regular household litters. After a week or so, you may choose to mix this litter with the one of your choice to start converting the kitten to more common litter types. As your Savannah cat starts to explore the house, they will most likely be attracted to things they should not be allowed near. One of these things are cords. Try to keep all cords out of reach, including toys with cords and electrical cords as these are easily chewed up and swallowed. Spraying or wiping vinegar or "Bitter Apple" cat spray on them will quickly discourage your Savannah kitten from attempting any chewing. Kittens are also attracted to house plants, so make sure that your house plants are not toxic. The curiosity of Savannah kittens should lead you to take the same precautions that you would if you had a human baby at its crawling stage in your home. Hide all plastic bags, rubber bands, chewable toys, cellophane tape, small plastic items, ribbons, hair ties, poisonous substances and cleaning products from your kitten. You should also ensure that your toilets are covered and bathtubs remain drained when not in use, as kittens like to explore. Remain on guard while closing doors such as the refrigerator, freezer, washing machines, and drying machines. Your kitten may attempt to play rough, bite, or growl. This is behavior that should be discouraged. Tapping your kitten on the nose and firmly saying, "No!" is one effective way to deter this. Time-out sessions may also work; you could place the kitten in a small room or in a cage or crate for a short amount of time. After a few time-outs or other forms of castigation, most kittens will understand that their negative actions will warrant punishment from you. Use of a squirt bottle has also proven effective in deterring bad behavior. We wean our Savannah kittens onto a raw ground chicken diet. Once they have proven to be holding their chicken well, we start mixing the chicken with Innova Evo wet food, turkey formula, and chicken formula. This is done at an increasing rate until they are exclusively eating the wet food. Innova Evo and Royal Canin Kitten formulas are also readily available to our kittens at all times. These kittens tend to drink very little due to the high moisture content of wet food. It is recommended that you continue to feed your kitten Innova Evo wet food twice a day for several weeks. If you plan to switch to a different food, do so gradually as to not interfere with your kitten's eating habits. Upon first arrival home, your kitten will most likely eat only a quarter of a can of wet food per feeding. If they clean this up with a few minutes, you can offer them more. Increase the amount of food per feeding as your kitten grows. Long term, we recommend that you completely switch to dry food as its caloric and nutritional content is much higher than that of wet food, which is generally 90% water. 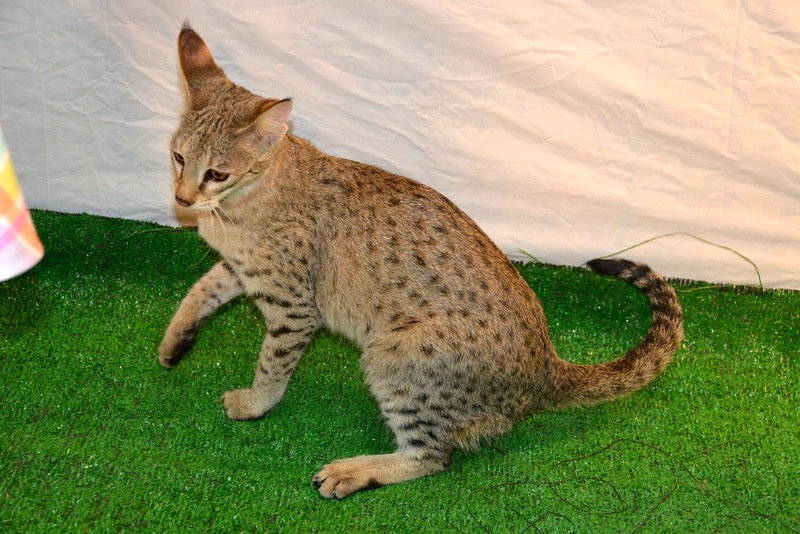 Savannah cats require the same vet care as domestic cats, with a few minor exceptions. When putting a Savannah under for surgery, isoflurane gas is recommended over injectable anesthesia. We also recommend the spaying or neutering of kittens at five to six months of age. Remember, it is your job to get your pet spayed or neutered. Savannah males may tend to spray if they are not neutered. Also, if the kitten is under four pounds, most vets will wait until it grows to put it under anesthesia. We use Pfizer Fel-O-Cell IV for our kittens, which is a vaccine that helps to protect against Panleukopenia, Rhinotracheitis, Calcivirus and Chlamydia. The manufacturer of this vaccine recommends boostering annually. However, many owners and trainers are choosing to do so every other year or every third year. We refuse to vaccinate kittens for Feline Leukemia since there tends to be a strong negative reaction to the vaccine. We do, however, vaccinate adult cats for it and have yet to experience ill-effects from doing so. It is recommended that once the kitten reaches four months of age to vaccinate for Feline Leukemia. 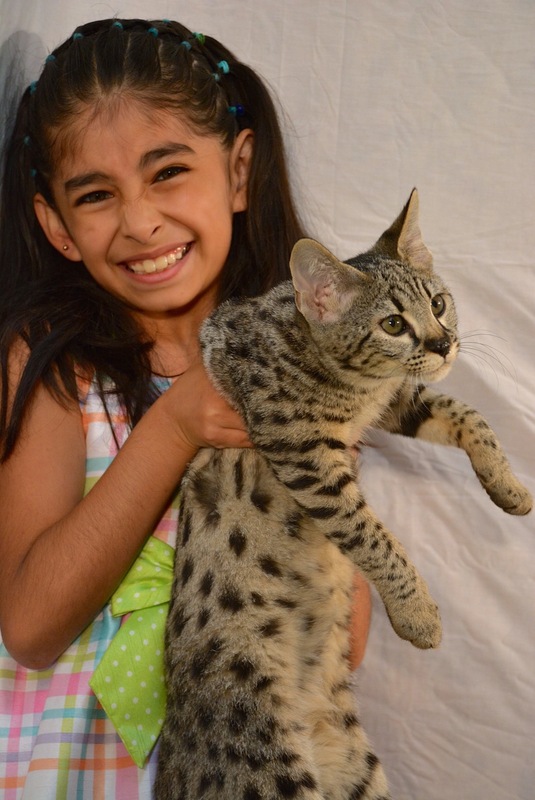 See Do's and Don'ts for information on how best to introduce your new Savannah kitten to your home.